Åmål-Årjängs railway is in western Sweden near the Norwegien border and extends through two provinces: Dalsland and Värmland. 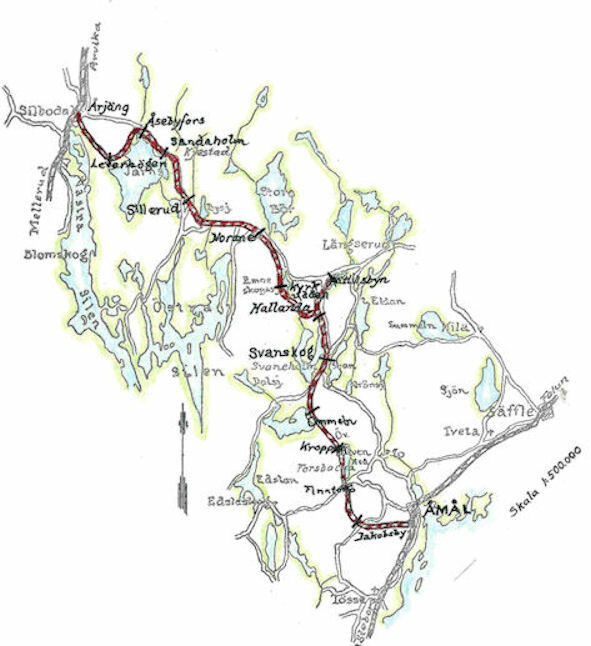 It starts in Åmål in Dalsland where it joined to Bergslagarnas railway (the largest private railway in Sweden until it was nationalized in 1948) to Årjäng in Värmland where it joined the Dals-Västra Värmlands Railway. At Norane, the railway crossed a narrow gauge line Stora Bör-Östra Silen Railway which transported timber from the lake Stora-Bör to the lake Östra Silen to be moved by lake and canal to the mill.